Today, FOX Sports announces an all-star team of broadcasters highlighting the first-ever FOX SPORTS PREMIER BOXING CHAMPIONS PAY-PER-VIEW: ERROL SPENCE JR. VS. MIKEY GARCIA. Current WBC Welterweight World Champion Shawn Porter, fresh off his victory live on FOX last Saturday, joins International Boxing Hall of Famer Ray “Boom Boom” Mancini and undisputed three-time heavyweight champion Lennox Lewis, adding insights and analysis. Porter and Mancini will join hosts Emmy Award-winning broadcaster Chris Myers and veteran broadcaster Kate Abdo live on FOX Sports’ desk for fight programming from Wednesday, March 13 through Saturday, March 16. Calling the action live on Saturday, March 16 (9:00 PM ET) on Pay-Per-View and streaming on the FOX Sports digital platforms are Lewis, legendary trainer Joe Goossen and Emmy Award-nominee Kenny Albert from AT&T Stadium in Arlington, Texas. Veteran combat sports journalist Heidi Androl reports and interviews fighters, while International Boxing Hall of Famer Jimmy Lennon Jr. serves as ring announcer. Marcos Villegas is the unofficial scorer. On FOX Deportes, current WBA Featherweight Champion Leo Santa Cruz joins Erik “El Terrible” Morales, Adrian Garcia Marquez, Jessi Losada and Jaime Motta to call the fights in Spanish. FOX Sports PBC programming begins Wednesday, March 13 (5:00 PM ET) on FS1 and the FOX Sports app with the one-hour FOX SPORTS PBC PAY-PER-VIEW PRESS CONFERENCE: SPENCE JR. VS. GARCIA, as host Abdo is joined by Mancini and Porter to preview the fights on the card and interview fighters. Androl and Ray Flores preside over the press conference. On Friday, March 15, the FOX SPORTS PBC PAY-PER-VIEW WEIGH-IN is telecast on FS1 and streaming on the FOX Sports app at 3:00 PM ET, with host Abdo and analysts Porter and Mancini again on the desk, previewing the fights. Lennon Jr. hosts the weigh-ins on stage, while Androl interviews fighters onsite. On Saturday, March 16 (5:30 PM ET) the four-part PBC FIGHT CAMP: ERROL SPENCE JR. VS. MIKEY GARCIA airs the final episode on FOX, following the two champions through their final preparations for the title fight. Saturday’s fight coverage continues at 7:30 PM ET on FS1 with the FOX SPORTS PBC PPV PREFIGHT SHOW previewing the evening’s epic battles. The show is hosted by Myers with analysts Porter and Mancini. Boxing begins at 8:00 PM ET live with the FOX SPORTS PBC PPV PRELIMS on FS1, FOX Deportes and the FOX Sports app, featuring former heavyweight world champion Charles Martin (25-2-1, 23 KOs) squaring off against unbeaten Dallas native Gregory Corbin (15-0, 9 KOs). 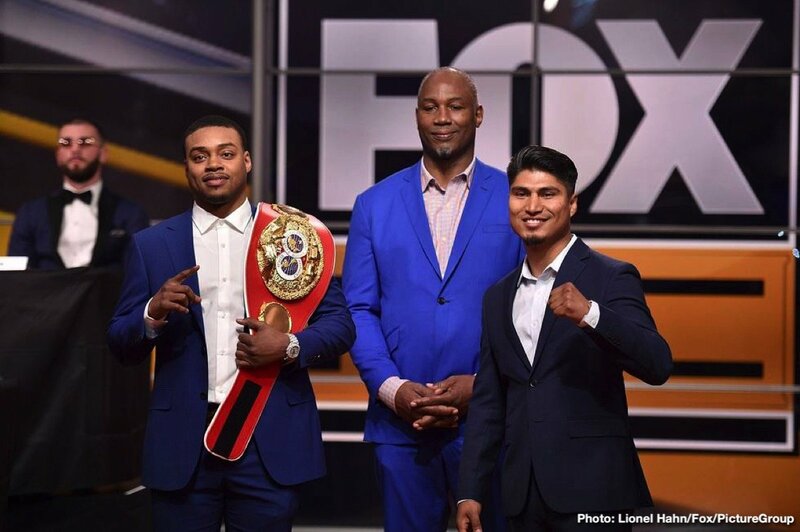 The FOX Sports PBC Pay-Per-View begins at 9:00 PM ET and is headlined by unbeaten IBF Welterweight World Champion Errol Spence Jr. (24-0, 21 KOs) defending his title against four-division world champion Mikey Garcia (39-0, 30 KOs). Undercard action features undefeated former super middleweight champion David Benavidez (20-0, 17 KOs) battling veteran contender J’Leon Love (24-2-1, 13 KOs), unbeaten former bantamweight champion Luis Nery (28-0, 24 KOs) taking on former champion McJoe Arroyo (18-2, 8 KOs) and fan-favorite Chris Arreola (37-5-1, 32 KOs) facing unbeaten Jean Pierre Augustin (17-0-1, 12 KOs). The evening’s action wraps up on FS1 at 1:00 AM ET with the FOX SPORTS PBC PPV POSTFIGHT SHOW as Myers, Abdo, Porter and Mancini recap the fights and interview winners. Leading up to the fights, PBC fighters offer unique, behind-the-scenes clips on the FOX PBC social pages. Follow @PBConFOX on Twitter, Facebook and Instagram for all updates throughout the #PBConFOX fights Saturday. Watch for the FOX RingPass, taking viewers behind the scenes and into the action on both Instagram and Facebook Stories. Viewers can live stream the PBC shows on mobile devices on the FOX Sports app, through the FOX, FS1, FS2 and FOX Deportes streams. The shows are available on desktop at FOXSports.com and on the FOX NOW app on connected devices including Apple TV, Android TV, Fire TV, Xbox One and Roku. In addition, all programs are available on FOX Sports on SiriusXM channel 83 on satellite radios and on the SiriusXM app.